6th-12th April: Jane will be hosting another ‘Get Writing’ taster session at Chez Castillon, France. 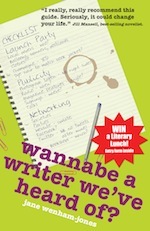 See Jane Wenham-Jones Get Writing! 6th -12th April 2019 for details. Sunday 5th May: This is Not a Book about Charles Darwin with Emma Darwin as part of the Chiddingstone Castle Literary Festival. Wednesday 8th May at 7pm: Alan Johnson – In my Life: a Music Memoir as part of the Whitstable Literary festival. Sunday 19th May: in conversation with… Terry Waite at The Pavilion, Harbour Street, Broadstairs, as part of the BroadstairsLit – click here for details. Saturday 25th May: Yoga to Write at the Anetai Yoga Studio, Ramsgate – click here for details. Jane will also be hosting more events at the BroadstairsLit. Watch this space…! Monday 4th March 2019: Jane compered the RoNas in London. See http://www.romanticnovelistsassociation.org/awards for details. Friday 9th November – Jane took part in a panel at the Sharjah International Book Festival. Friday 19th October – Vinyl Revival with Graham Jones at Broadstairs Lit Fest. Click here for details. Tuesday 9th October – Jane hosted an interview with Bryony Gordon at the Guildford Book Festival. Click here for details. Monday 8th October – Jane hosted an event at the Guildford Book Festival. Click here for details. Thursday 27th September – Jane launched her latest novel, Mum in the Middle, and shared the limelight with some of our most popular and successful local authors. There was book stall hosted by Waterstones Thanet; author spotlights; entertainment; live music. And Jane was joined by an exciting line-up of TBC Kent-based writers. This was a free event. Further details of forthcoming events: broadstairslit@gmail.com. Thursday 21st June – ‘Being David Archer’ with Tim Bentinck and Sunny Ormonde (Lillian Bellamy) was at Broadstairs Lit Fest. Click here for details. Friday 6th April – Keep It In The Family with Hunter and Caitlin Davies was at Broadstairs Lit Fest. Click here for details. 10th March 2018: Jane interviewed Sir Tony Robinson in Broadstairs as part of the ongoing BroadstairsLit. Friday 16th February – The Perfect Match: Romance, Prosecco, Canapes and Chocolate with Katie Fforde and Jo Thomas. Jane was in conversation with Katie and Jo for BroadstairsLit. Click here for details. Sunday 28th January – first storytelling session from BroadstairsLit was at the Yarrow Hotel. Click here for details. Thursday 25th January – BroadstairsLit presented “Supper and Chaat” with Chetna Makan. Included three course meal and Q&A with Jane. Click here for details. 18th-21st January 2018: Jane hosted the ‘Get Writing’ taster session at Chez Castillon, France. See https://www.chez-castillon.com/course/get-writing-taster-course for details.